It’s stories like these that separate tutoring from teaching for me. It is why I worked so hard to return to a position where I can spend the bulk of my day mentoring others through a wide variety of issues and concerns. 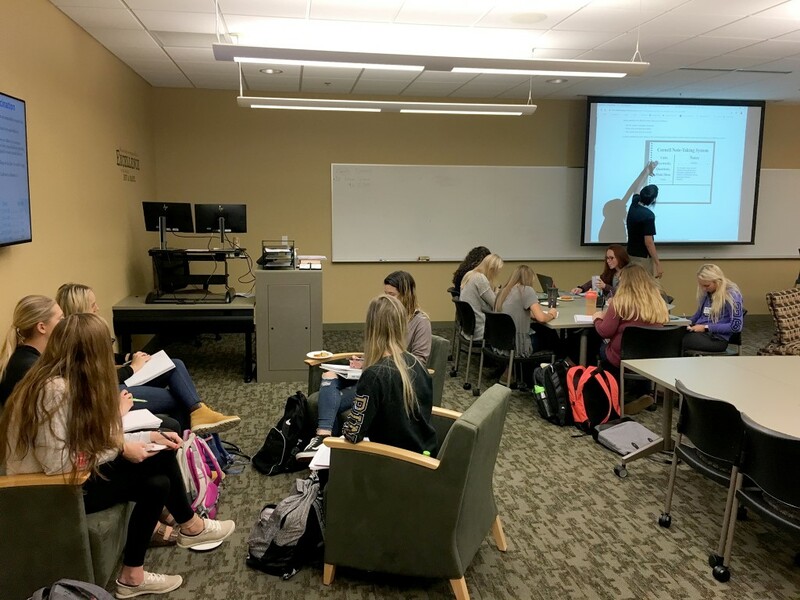 Writing Center/Student Success Center (SSC) work affords one the chance to build relationships with your clients and care for them on a much deeper level in many cases than one can when teaching a class of 60-100 students. Truth be told, I feel truly blessed to be where I am today at Bellin College (BC). WLN Blog: What about Bellin College? What is the focus of the institution? Adam: BC is a private nursing school and graduate school of sciences located in Green Bay, Wisconsin. Formed in 1909, BC has been educating health professionals for over 100 years. The college has evolved immensely over the years and now offers its 510 students undergraduate degrees in Nursing (BSN), Radiological Sciences, and Diagnostic Medical Sonography. In addition to undergraduate degrees, BC also offers a Master of Science in Nursing degree at the graduate level. Nursing graduates have a 94% pass rate on the NCLEX-RN licensure exam, which is well above the national average of 85%. As of 2018, the college now offers all of its own general education courses and no longer relies on the dual enrollment process. WLN Blog: How did you arrive at Bellin? 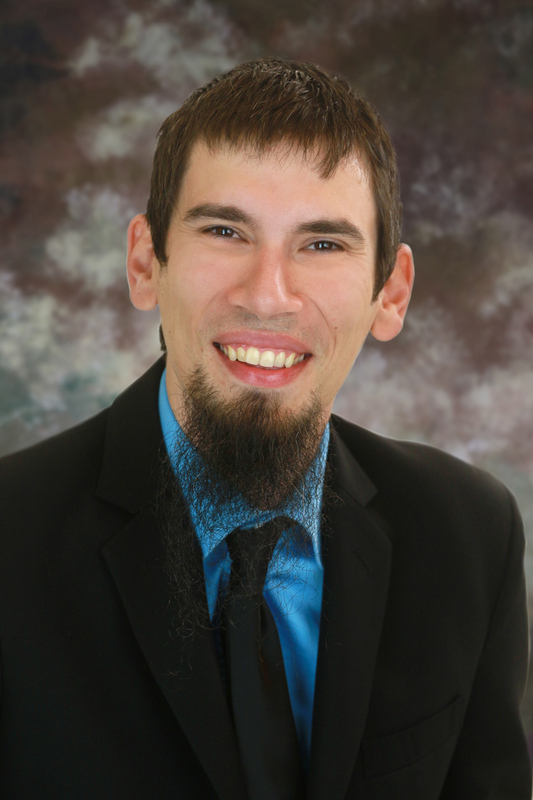 Adam: Around the same time my wife and I were discussing how wonderful it would move closer to our families in Wisconsin, BC was struggling with the sobering reality that only 59% of its traditional BSN students were graduating. 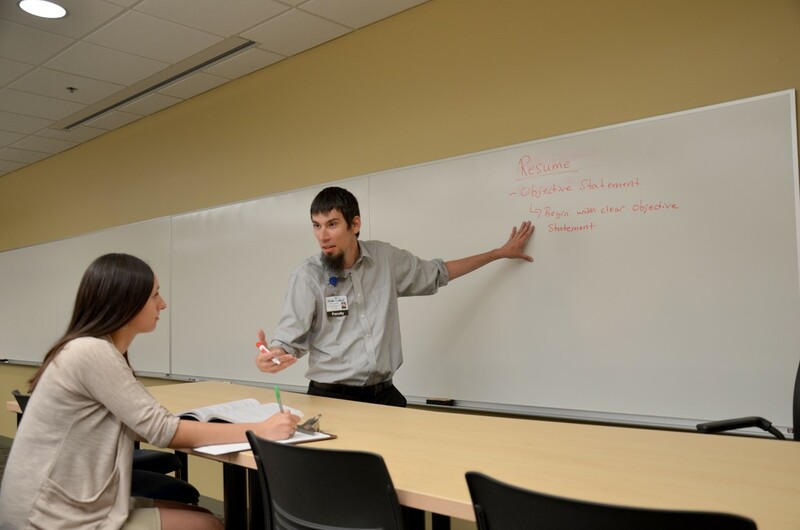 Simultaneously, the end of dual enrollment at Bellin meant that students could no longer utilize previously taken-for-granted amenities at partner institutions, such as Writing Centers and Student Success Centers. When I saw the opening for the SSC Coordinator position at BC, my wife and I realized we had a legitimate opportunity to return to our home state of Wisconsin. On a professional level, I was particularly intrigued by having a chance to join a small, collegial institution where I would be the sole representative of both the English and Communication Departments. After my campus interview and teaching demonstration, there was no doubt in my mind that having the chance to teach at an institution whose student body was made up of like-minded, highly-motivated future health professionals was a perfect fit for me. This allowed me to cater my own new courses, Composition & Professional Writing and Health Communication, to a specific demographic of students who will experience similar rhetorical situations in their coursework and future places of employment. WLN Blog: What is the setup of your centre? Adam: The entirety of BC is located within one building, and the Student Success Center (SSC) is located on the second floor next to the campus library. As a result of being housed under the small but growing General Education program, the SSC’s physical space is primarily staffed by myself (20 hours per week) as well as the Director of General Education, Dr. Casey Rentmeester (10 hours per week), between the hours of 9am and 3pm. Once students badge-in with their campus identification card, they may use the center in a multitude of ways. The center provides both individual and group study spaces, a small computer lab (4 computers with access to a printer, scanner, and copy machine), a “genius bar (explained below),” two lounge areas with soft seating, four large marker boards, numerous desks for studying and tutoring sessions, a television that advertises campus events, a large filing cabinet with numerous handouts on study skills and writing tips, and a primary computer station with access to a large presentation screen with sound capability. One of the most highly used spaces is the center’s genius bar, which allows up to six students to receive focused mentorship from either a faculty or student tutor. This space provides the tutor a large table to work at, multiple whiteboards, and a projection screen–essentially, creating a mini-classroom for students. Fortunately, I am surrounded by colleagues and students who share my passion for student success. Currently, we have 14 faculty tutors who spend, at minimum, one hour tutoring in the SSC each week of the semester. 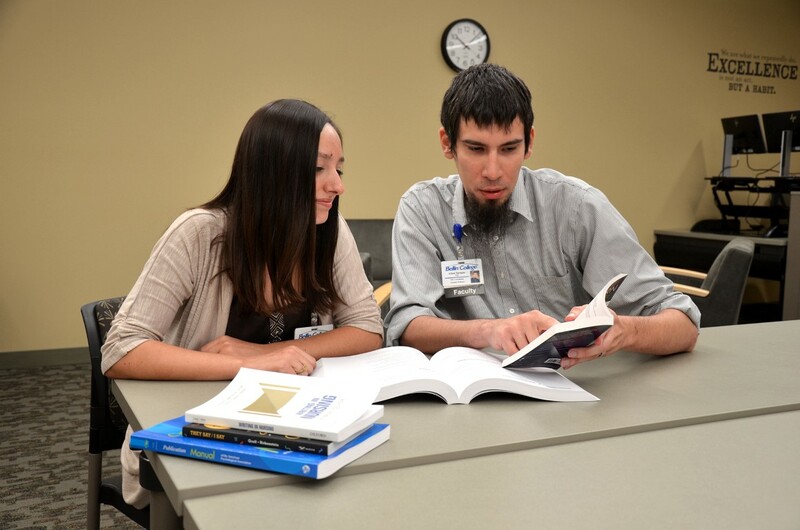 We also have 11 student tutors with specialties ranging from Intermediate Algebra to Advanced Pathology. Although the center is not staffed by faculty or students after 3pm, all resources remain available to students until the campus closes at 8pm. Moreover, in addition to the SSC’s physical space, the center also utilizes a virtual space integrated within the college’s course management system (CMS) that houses a wealth of resources pertaining to student success at the college level and beyond. The space also lists all of our faculty and student tutors by name, rank, their areas of specialty, and includes professional photos of all tutors. Everything from guided meditations that I have recorded myself to resume writing tips can be found quickly and easily on the center’s CMS page. This, as well as our scheduling software, MYWCONLINE (https://bellincollege.mywconline.com/), have been designed with the student in mind, meaning the content of the various pages as well as the process to schedule a tutoring session remains always only a few clicks away. In less than two months, we have had over 300 students access the CMS page, many spending more than 2 hours on the page. Finally, one of the more unique features of our online space is that it also houses our first-year experience (FYE) online course, “College 101.” In 2017, prior to the FYE course falling under the SSC umbrella, just 74.42% of Bellin students completed the course successfully, which focused primarily on the basic skills needed to succeed in college. Over the summer, prior to the start of my first semester as Coordinator of the SSC (Fall 2018), the College 101 course was moved to the SSC’s CMS page. We advertised that the SSC would hold a pizza party on October 3rd in the SSC for all students who completed the course. 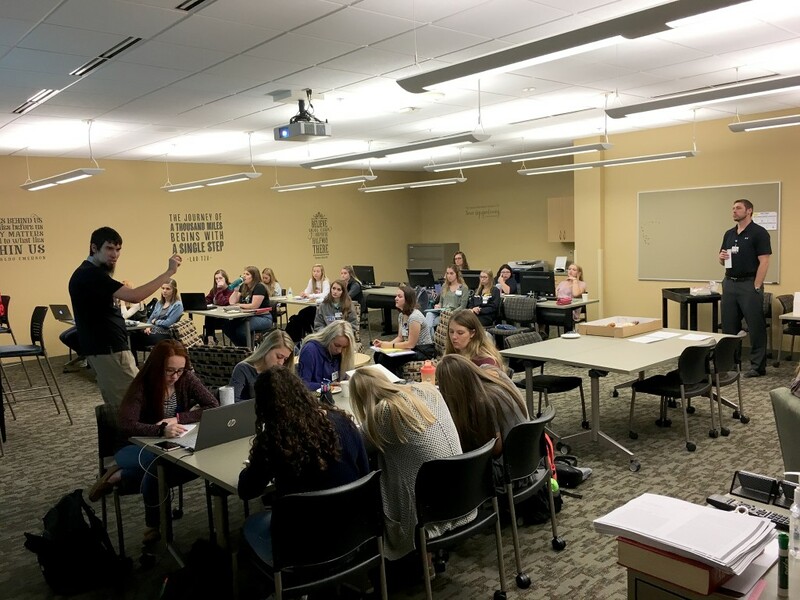 Whether as a result of housing the course in the same space as the SSC’s study guides and worksheets, or as a result of having a pizza party promised to them, we saw a significant increase in student success as 81% of Bellin students completed the course successfully. To sum up, my number one goal when I stepped into this position was to put myself in the students’ shoes and create a multifaceted support net that would assist as many unique individuals and their varying learning styles as possible. I do believe we have started to achieve that goal. WLN Blog: What were some of the difficulties you encountered? Adam: Despite the center’s successes, there were bound to be some mishaps and challenges as we grow as a unit. Currently, there are no permanent, on-site paid tutors or staff in the center unless a student signs up for a tutoring session with one of our tutors online. This presents unique challenges as some students have voiced frustration over the fact that they are unable to receive immediate help at all times in the center. There were other unexpected challenges as well. Simply finding furniture became a challenge. Dr. Bake, Dr. Rentmeester, and I acquired as many unused bulletin boards, tables, chairs, and soft seating as we could from other locations around campus. While we feel proud of the layout of the space given the resources we had, we all hope to improve the layout and color scheme of the center in the very near future as funds become available. While the badge reader not working for a week was also somewhat of an initial scare, we as a college are met with the much larger issue of staffing. Currently, as evident by the numbers presented below, the center remains unprepared for student drop-ins. Burnout is a concern as I am currently on pace to hold roughly 678 tutoring sessions in a single semester in addition to teaching two courses each semester. We are also severely understaffed at the front desk (only staffing the desk for 2 hours twice a week), and I will need to be proactive in continuing to push for paid assistance in the SSC to meet our high demand of tutoring, data entry, and paperwork. WLN Blog: How has the centre been received now that it’s open? Adam: I am so incredibly proud of the work that my colleagues and I have completed in such a short period of time. I am especially grateful to Dr. Mark Bake, Dean of Allied Health Sciences, and to Dr. Casey Rentmeester, Director of General Education, for the trust and confidence they put in my knowledge base and ability to implement my vision. Having started my position less than two months prior to the start of the Fall 2018 semester, I knew there was much to be done in an incredibly short period of time. 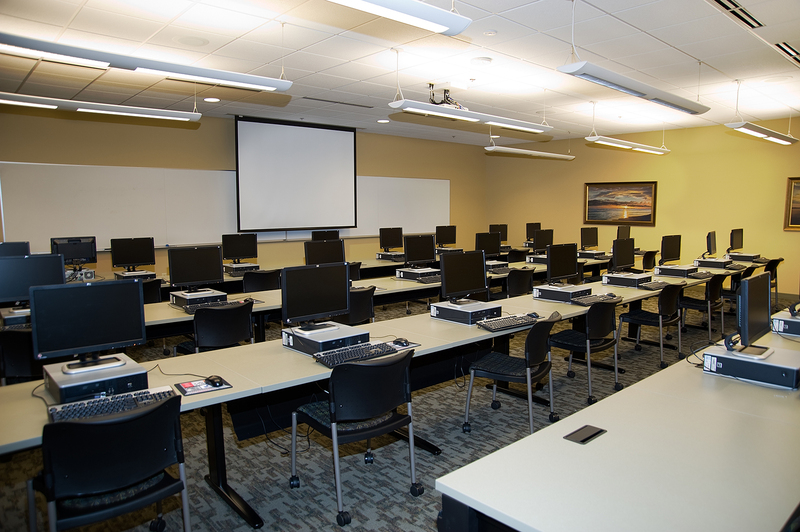 Once we had as much in place as we could, both physically and digitally, we could only wait and see how our students would receive their newly remodeled computer lab, now SSC. Overwhelmingly, the center has been a success. As of October 5th, 2018 (less than 2 months since the start of the semester), 550 students have utilized the SSC. This number is staggering when we also consider that our badge reader malfunctioned for nearly the entire first week of the semester. Also, a total of 51 tutoring sessions have been requested with both faculty and student tutors using our online system by 43 nursing students, 3 Radiology students, 2 Sonography students, and 2 graduate students. Between the hours of 9am to 3pm, student drop-ins are also tracked by the faculty member in the SSC via a Microsoft Excel spreadsheet stored on a campus shared drive. Through October 5th, 355 total drop-in tutoring sessions have been provided to students during these hours in regard to a wide range of topics–339 of those students were tutored by me, and 16 tutored by other faculty members. Workshops, or “sessions” as we refer to them in the SSC, have also been a success. For example, our first session in September, hosted by Dr. Casey Rentmeester and I, focused on the Cornell Note-Taking Method and had 24 student attendees. Students responded positively to the session, and I have noticed Freshman and Sophomore students now using the method in my own courses. Our next session, “Simply Being: A Guided Meditation with Dr. Sprague,” is scheduled for October. In short, for many students, the SSC has become their go-to place on campus to study and relax with their friends and get help when needed. While I’d like to supply more details here because we do provide each client with an exit survey about their tutoring session, and because the responses have been incredibly positive, official numbers will not be calculated and reported until the end of the current academic year. WLN Blog: What are the future plans for your centre? Adam: To some degree, out future plans include more of the same. We will continue to host group sessions on stress reduction, study skills, writing, and preparing career documents. In fact, we have two Resume and Cover Letter sessions scheduled for the month of November. Another main focus for the future is to redesign the center’s space with wall-mounted computer monitors and circular desks to better use the space and better facilitate and promote group study. This, however, will take time and money to implement. Finally, one of my main objectives for next semester is to begin to offer faculty sessions in the SSC as well. Faculty have already approached me on the need for sessions on APA format, rubric and assignment design, and letter of recommendation writing. I believe roundtable interdisciplinary discussions like these will allow faculty to voice their concerns and questions and help BC move forward in the best way possible to facilitate both student and faculty success. WLN Blog: What do you like about your work? What draws you in? Adam: What draws me to tutoring is that it is not static. Tutoring, for me, is a project-based practice. Each client has unique abilities and questions. When I received my Ph.D. from BGSU, I never thought I’d be able to combine my passion for teaching and working one-on-one with students on stress reduction techniques like meditation. My role as SSC Coordinator allows me to do just that. To wrap up, nothing makes me happier than making others happier. I love the challenge of working with students who feel they cannot succeed, working with them to change that mindset, and watching them increasingly succeed as the weeks go on. The person, not the “student,” has been my focus, is my focus, and will remain my focus as long as I do this work.